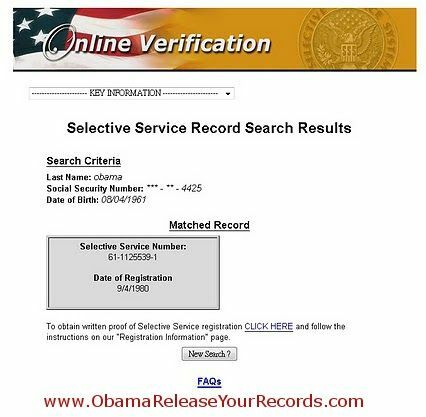 One can go to the Selective Service registration verification website, enter the name Barack Obama, his SS#, and birthdate (August 4, 1961), and the system will find a match. Therefore, Hollister's document appears to be genuine, and the Social Security number Obama used by Obama for that registration is also verified. A sample verification is shown below, and you can obtain this too if you are lucky, but most who try will receive the error message "you have exceeded the daily limit for this search criteria," which is obviously meant to discourage validators and avoid disclosure. It has already been proven by former Federal ICE agent, Stephen Coffman, that Obama's Selective Service document was faked, and recorded at a later date than the document specifies. You can hear and download an audio recording of attorney Debbie Schlussel explaining why the registration is fraudulent, as heard on Denver talk radio station 630 KHOW on February 7, 2011. Debbie received her documentation concerning the registration fraudulence directly from Stephen Coffman. This is really interesting, because there are multiple instances of fraud related to the registration. Debbie explains that the registration was created in 2008, rather than in 1980, that it was done on a modern form not available in 1980, and bears a "US Post Office" stamp. That stamp was discontinued well before 1980, when the name was changed to the US Postal Service. And those are just a few of the inconsistencies involved. 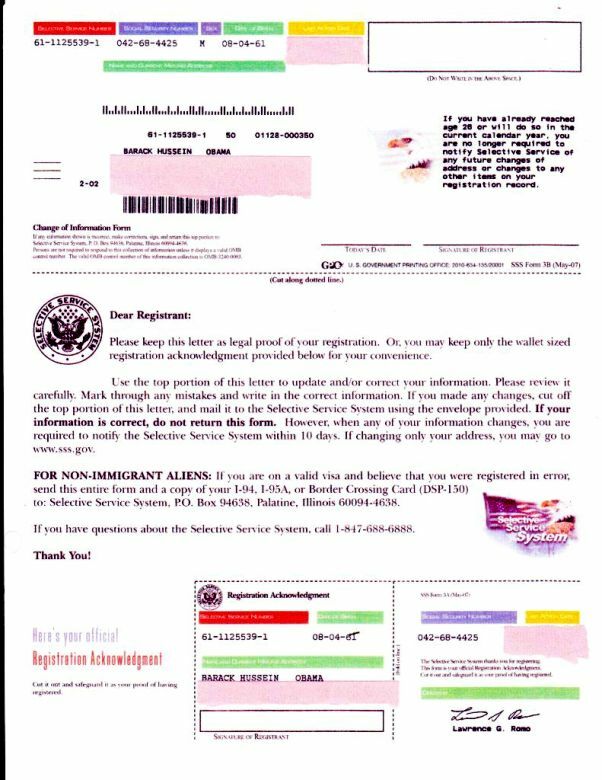 I would have to say that the most glaring bit of fraudulence concerning Obama's Selective Service registration is the Social Security number shown on that document. We heard, some time ago, that Obama's SS# is actually a Connecticut number that was registered to someone born in 1890. A visit to the Social Security verification website bears out the fact that numbers issued to Connecticut applicants after 1973 used 040 to 049 as the first three digits of a SS number, so this validates Obama's number as being a Connecticut one. Problem is, Obama never lived in Connecticut. At the time the number was registered, in 1977, Obama was 15, living in Hawaii, and working for Baskin Robbins Ice Cream. So how did his number get registered as a Connecticut number? A story was released on the Internet April 12th, exlaining that the SS# used by Obama has been traced to a French immigrant to the US by the name of Jean Ludwig. Ludwig applied for his SS# in 1977, while still living in Connecticut, and died in 1981 at the age of 91. I ran a Social Security Death Index search at ancestry.com for Jean Ludwig and determined that he did die in 1981 in Honolulu. What's interesting about his death in Honolulu is that Madelyn Dunham, Obama's maternal grandmother, worked as a part-timer or volunteer in the Probate Office in the Honolulu Hawaii Courthouse. Thus she would have had access to the estate files of anyone who died there. If the 91 year old man, originally from CT, died intestate in Hawaii with no known relatives, Dunham would have known this person was a prime candidate for Barack to assume his card number. Heck, this happens all the time with SS #'s of deceased individuals being used for vote fraud and illegal aliens. Now Obama bots would point to the fact that Obama's SS registration was in 1977, not in 1981 (four years later), and that Dunham could not possibly have pulled off such a miracle unless she was a time traveler. Fact is, though, the most logical explanation is that Obama's record was faked by simply changing the physical and database records of Jean Ludwig, who was registered in 1977, to replace his name with Obama's. This scenario not only is logical, but also seems very likely, especially when one considers the fact that the Social Security Administration office which handles and stores record assignments is located in Chicago, where Obama has many corrupt allies who could have arranged for the switch. They probably felt comfortable doing so, since by law Social Security records cannot be disclosed publicly, so it would be almost impossible for anyone to gain access to the physical record to examine it. The only thing certain is that both Obama's SS# and Selective Service registration are bogus documents. Bogus, just like everything else concerning Obama.